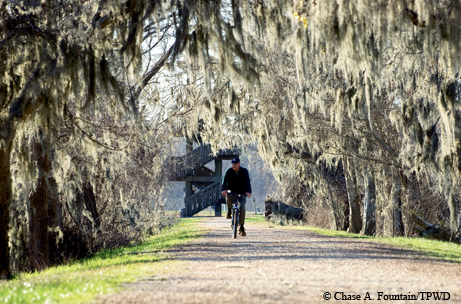 ﻿﻿﻿﻿﻿﻿﻿Brazos Bend State Park beckons with opportunities to create outdoor memories. ﻿﻿﻿﻿﻿﻿﻿The house still stands, once his childhood playground in the woods along the Brazos River. For Barry Eversole, this place shaped his life long before he became a game warden. He spent much of his youth in the late 1960s there with his great-uncles, Robert and Dean Brumbelow, on what later became Brazos Bend State Park. “We fished the river, using throw lines tied to a tree,” he recalls. They caught flathead and blue catfish, then fried them in cornmeal for dinner. Eversole also camped near the house and rode many miles in the surrounding woods on his bicycle. Baby alligators in nests nearby made a croaking sound back then. Still do, and that keeps the memories fresh in his mind. Want to enjoy your own backcountry adventures at Brazos Bend? The park offers hiking, mountain biking, horseback riding and camping at a primitive campground that snakes around the Brumbelow brothers’ house. Bring a canoe or kayak and launch it into the river from the close-by Yellowstone Landing Trail primitive boat launch. The trail’s rope line will help get the boat back up the steep slope. Do you enjoy fishing? Bring a rod and reel to the Brazos River or the park lakes. River anglers often catch flathead catfish, buffalo and freshwater drum, while the lakes yield largemouth bass, panfish and channel catfish. Watch as some of the park’s many American alligators stalk the lakes for food. Park facilities include campgrounds, playgrounds, picnic sites, two group picnic pavilions and a group dining hall. Travelers on the park’s 35 miles of multi-use trails may encounter cricket frogs, white-tailed deer, armadillos and green anoles. The new observation deck on Elm Lake offers birders a great place to observe many of the more than 300 species of birds that have been seen at the park. While you’re here, don’t miss the park nature center. It’s open every day and offers a variety of interpretive programs on the weekends. 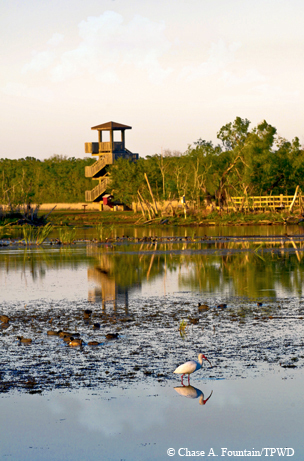 Brazos Bend State Park is located about one hour south of downtown Houston. From U.S. Highway 59, take the Crabb River Road exit heading south. From Texas Highway 288 take FM 1462 west and follow FM 762 north. For more information, visit www.tpwd.state.tx.us/brazosbend or call 979-553-5102.